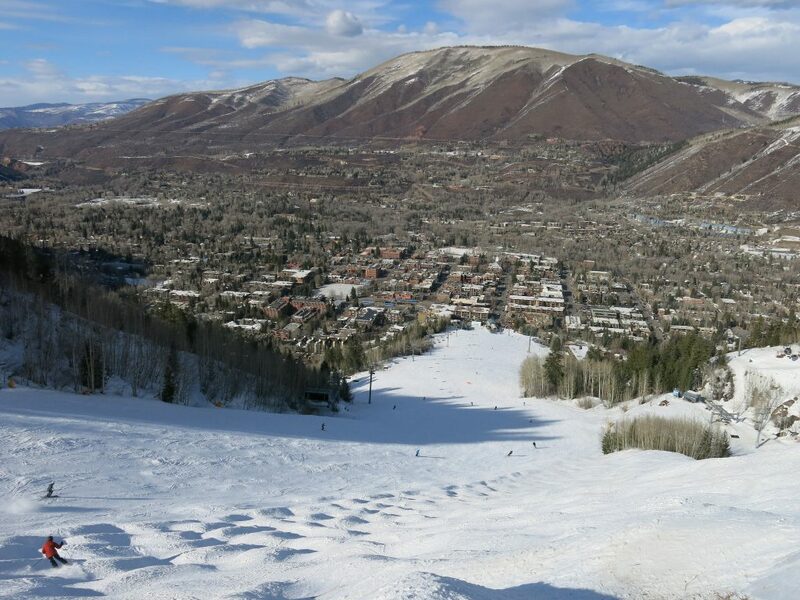 Aspen Mountain (Ajax) was the first of the Aspen ski resorts to open in 1946. The skiable terrain hasn’t changed much since the 50’s when my father skied there, and is very small at only 675 acres, but it has a stellar reputation and draws dedicated skiers back year after year. 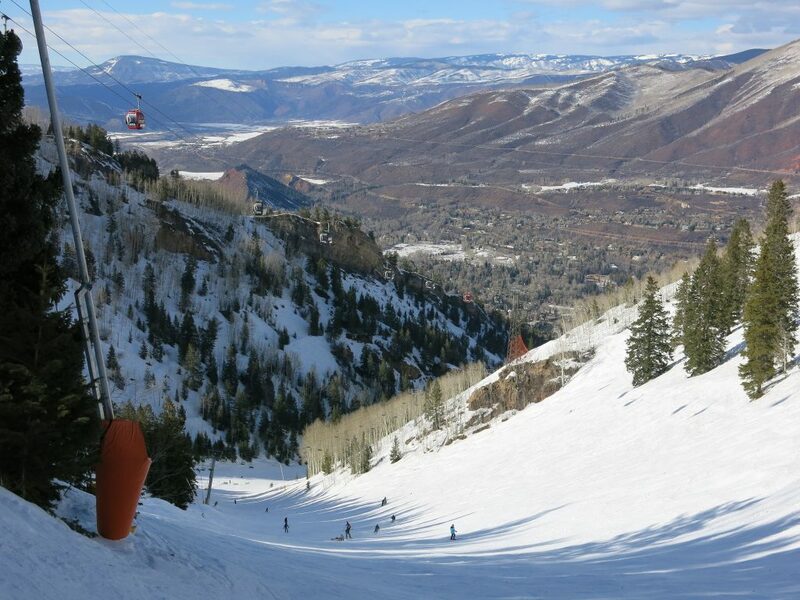 Aspen Mountain has the distinction of being the only resort on our list with no beginner terrain. It’s quite steep just about everywhere, but there is a large area at the top with some low intermediate terrain. 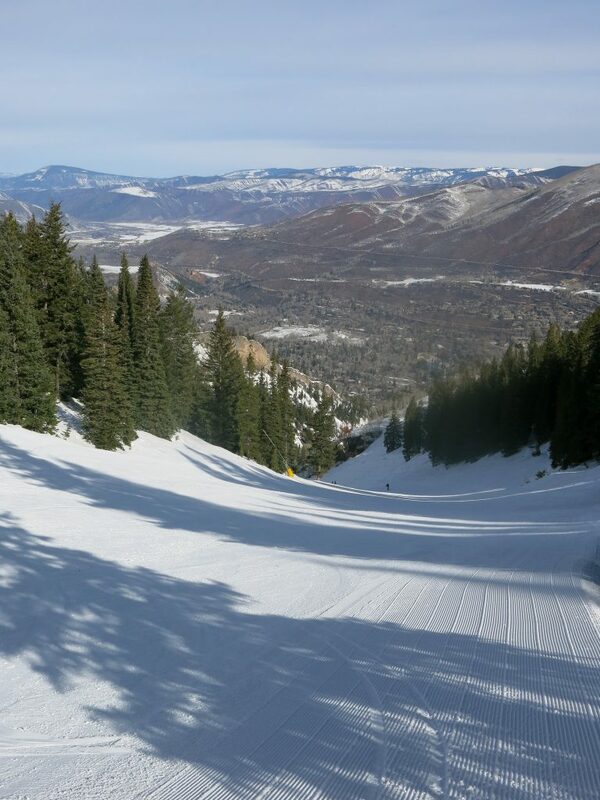 Your day at Aspen will most certainly start on the Gondola, which takes you right to the top. In the late 90’s when I was Paragliding I flew down from near the top of the Gondola to the valley floor after launching from Walsh’s during the US National Paragliding Championships. It’s a spectacular experience that younger me relished, but older me is happy to just ski down now! 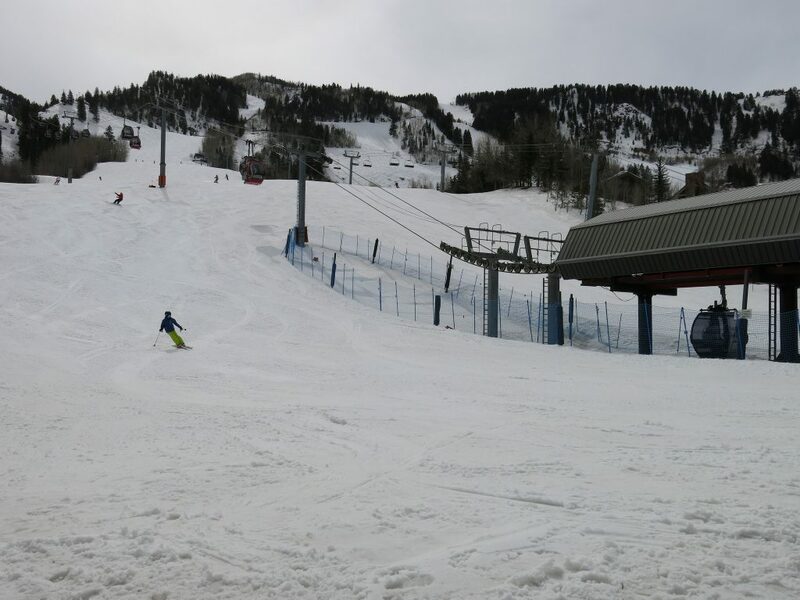 The best run on the mountain for us was Copper to Copper Bowl to Little Nell. That’s a 3,267′ vertical steeper blue groomer that is largely in a gully. It’s groomed well, but watch out for people using the gully as a huge half pipe. With lots of people using the whole run it’s a bit dangerous and sure enough we saw the aftermath of a really bad collision at the bottom of Copper Bowl. 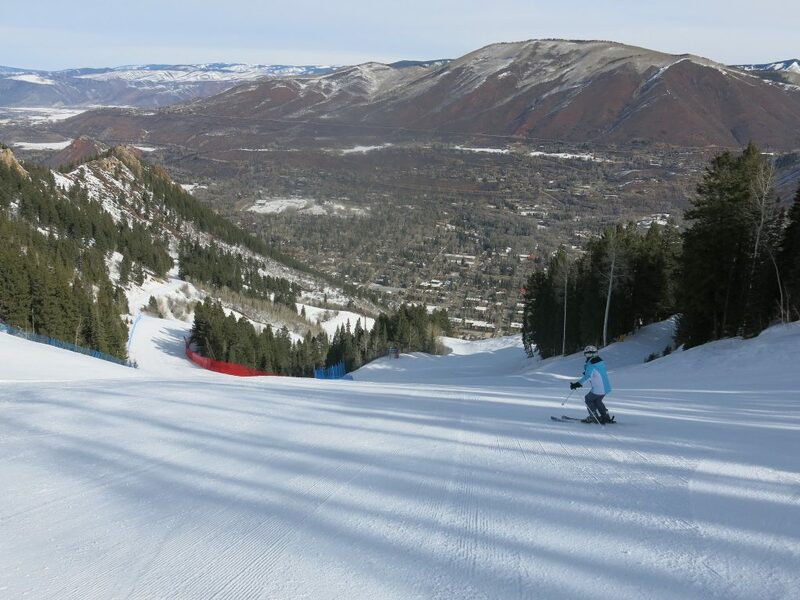 The other main top-bottom run is Spar Gulch, which has a little less traffic. Between the 2 of these and the gondola you could accumulate massive daily vert if you are into that. We skied all the available pods and hit just about all the groomed runs. Off-piste was bulletproof and thin, so we didn’t venture onto any of the many double-blacks this time. When I skied there back in the late 70’s with my brother conditions were better and we spent a lot of time in the bumps of Bell Mountain. 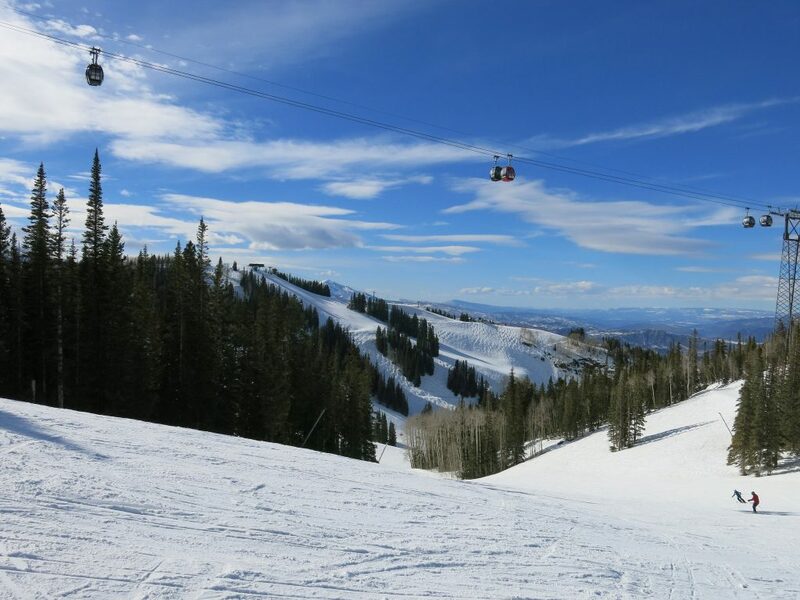 There are 3 other ski resorts in Aspen and 2 of them are better in many ways, but Ajax is the favorite of most people that live or stay in the town of Aspen. We spoke with some locals that ski Ajax 90+% of the time. We also met a guy who goes to Aspen every year, rents a place in town for a couple of months, and skis Ajax every day. It’s a place that seems to inspire a lot of loyalty. We found it to be really fun and unique. The mountain skis well as a top-to-bottom pod, but there are 4 other distinct pods as well. On the bottom lookers right Shadow Mountain is a steep high-speed run with great grooming. It was somewhat unusually warm when we were there so it had already corned and iced up, but it was still quite good. Above that is Ruthies which is a pod with several nicely groomed wide runs. International to Shiller Road is one of the few black groomers and we did that a couple of times. They were setting up for a race and we saw some US Ski Team female skiers free-skiing at really high speed on Ruthies itself. The Ajax Express is the most popular pod at Ajax with lots of low-intermediate terrain. We only took a couple of runs there because it’s a bit too flat. They could probably rate some of this as Novice terrain, but I think the logistics of getting beginners up there back down again made them just call it all blue. They probably want to steer novices over to Buttermilk or Snowmass where they will be much more comfortable. F.I.S. is a very short lift but with a nice steeper black groomer. Lastly, Gent’s Ridge is slightly steeper upper-mountain terrain that has some nice winding blue runs with some steeper pitches. It’s a long slow lift though, and we were running out of time so only took a couple of runs there. It’s probably almost as fast to ski all the way down to the Gondola and take that back up than it is to take the chair. We didn’t eat on the mountain because there are lots of non-resort options within a block of the bottom of the Gondola. We like it when that’s an option because it’s always cheaper and sometimes better. Aspen does a pretty good job with food service though, so I’m sure Ajax is no different than Snowmass and Highlands. If we find ourselves in Aspen again we will definitely spend a day there bombing down Copper and Spar.